The role of Diabetes mellitus (DM) in the etiology and in the antimicrobial resistance of uropathogens in patients with urinary tract infection has not been well clarified. For this reason we have evaluated the spectrum of uropathogens and the profile of antibiotic resistance in both diabetic and non diabetic patients with asymptomatic urinary tract infection (UTI). Urinary isolates and their patterns of susceptibility to the antimicrobials were evaluated in 346 diabetics (229 females and 117 males) and 975 non diabetics (679 females and 296 males) who were screened for significant bacteriuria (≥105 CFU/mL urine). The mean age of diabetic and non diabetic patients was respectively 73.7 yrs ± 15 S.D. and 72.7 ± 24 (p = NS). Most of our patients had asymptomatic UTI. The most frequent causative organisms of bacteriuria in females with and without DM were respectively : E. coli 54.1% vs 58.2% (p = NS), Enterococcus spp 8.3% vs 6.5% (p = NS), Pseudomonas spp 3.9 vs 4.7% (p = NS). The most frequent organisms in diabetic and non diabetic males were respectively E. coli 32.5% vs 31.4% (p = NS), Enterococcus spp 9.4% vs 14.5% (p = NS), Pseudomonas spp 8.5% vs 17.2% (p = <0.02). A similar isolation rate of E. coli, Enterococcus spp and Pseudomonas spp was also observed in patients with indwelling bladder catheter with and without DM. No significant differences in resistance rates to ampicillin, nitrofurantoin, cotrimoxazole and ciprofloxacin of E. coli and Enteroccus spp were observed between diabetic and non diabetic patients. In our series of patients with asymptomatic UTI (mostly hospital acquired), diabetes mellitus per se does not seem to influence the isolation rate of different uropathogens and their susceptibility patterns to antimicrobials. Diabetes mellitus (DM) has long been considered to be a predisposing factor for urinary tract infection (UTI). However, since the concept of significant bacteriuria was introduced the reported data on the prevalence of asymptomatic bacteriuria appear to be conflicting [1–3]. Many UTIs are asymptomatic, especially in women. Unlike men with or without diabetes (among whom similar rates of UTI have been documented in most studies), several recent reports have noted a higher prevalence of asymptomatic bacteriuria among women with diabetes than among women without diabetes. However, other studies on asymptomatic outpatient diabetic women reported different results regarding the prevalence of bacteriuria [[4–17] table 1]. The most common cause of UTI in men and women with and without DM is E. coli. Some reports have noted that a lower proportion of UTIs is caused by this organism in diabetic patients as compared with age-matched non diabetic patients [12, 18–21]. Antimicrobial resistance among uropathogens causing community and hospital acquired urinary tract infections is increasing . Few data are available on the role of DM itself as a risk factor for the development of antimicrobial resistance of the uropathogens. For over 10 years our unit has been involved in a program dedicated to the epidemiological surveillance of both symptomatic and asymptomatic urinary tract infections. Particularly, the local trends of the causative agents of urinary infections and their resistance patterns to the antimicrobials are being monitored. For this reason we have undertaken a study to evaluate the spectrum of the etiologic agents and their profiles of antimicrobial resistance on a large series of diabetic and non diabetic patients with UTI. Between March 1996 and June 2003, 10221 patients who were over the age of fifthy (6708 females and 3513 males) who were admitted to the department of medicine of the Pisa University-Hospital, were screened for asymptomatic bacteriuria (ASB). Out of the total studied population 1321 (12.9%) patients showed ASB. The criterion used for defining asymptomatic bacteriuria was the presence of at least 105 CFU/ml in 1 culture of clean-voided mid-stream urine specimen or obtained by urethral catheterisation. Regarding the patients with ASB, urine samples were obtained by clean voided mid-stream technique in 1066 patients and by urethral catheter in 255 patients with an indwelling bladder catheter. All of the patients were admitted to the department of medicine of the hospital of Pisa as inpatients. One- hundred and fifty patients were transfered from surgical or urologic wards. One year prior to admittance 320 patients had a history of urethral catheterisation. Three-hundred-forty-six patients were diabetic (117 males and 229 females) and 975 non diabetic (296 males and 679 females). Quantitative urine culture was performed using a dip-slide method; urine was also streaked on MacConkey agar. After an incubation at 37°C for 24 h, the microrganisms were identified by standard biochemical tests. In vitro susceptibility to antibiotics was performed by an agar diffusion method (Kirby Bauer) employing dried filter paper discs impregnated with specific concentration of antimicrobial agents in according to the National Committee for the Clinical Laboratory Standards. (Performance Standards for Antimicrobial Testing. Wayne, PA: NCCLS, 1995). All the patients with UTI were interviewed by the authors on the basis of a specific questionnaire in order to know their age, gender, presence or absence of symptoms of UTI. The criteria used to exclude possible diabetic patients from non diabetic group was to make sure that they had a negative diabetic history and absence of glycosuria and fasting blood sugar less than 126 mg/dl. The statistical analysis of the results was carried-out using X2 test. The research was conducted according to the Helsinki Declaration and was approved by the local ethic committee. Furthermore, all patients were informed about the aim of the study and their consent was obtained. In the period between 1996 and 2003, 1321 (12.9%) out of 10221 patients (all older than 50 yrs;) who were admitted to the department of medicine of Pisa General hospital were found to have significant bacteriuria. Most of them had asymptomatic bacteriuria. The rate of ASB was 12.76% (117 out of 917) and 11.4%(296 out of 2596) respectively in diabetic and non diabetic males. The rate of ASB was 14.97% (229 out of 1529) and 13.1% (679 out of 5175) in diabetic and non diabetic females respectively. Regarding the patients with ASB, 346 patients (229 females and 117 males), had a diagnosis of diabetes mellitus (90% type II DM) and 975 (679 females and 296 males) were non diabetic patients. The mean HbA1c level of the diabetic patients at the time of admission was 7.8% ± 1.6 SD. 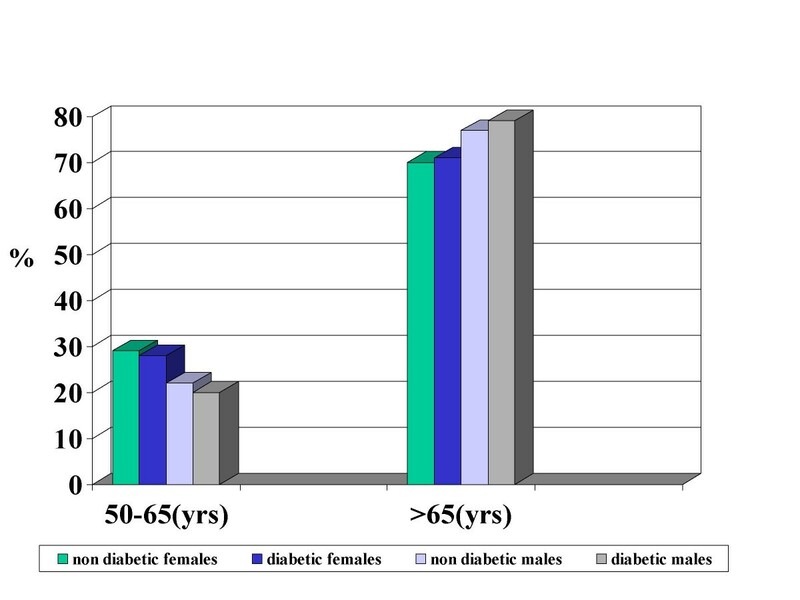 The mean age of diabetic and non diabetic patients were respectively 73.7 yrs ± 15 SD and 72.7 ± 24 (p = .NS). The distribution of the diabetic and non diabetic patients with bacteriuria in according to the gender and age is represented in the figure 1. No statistical differences were found between diabetics and non diabetics in the different groups of age and gender; Seventy-eight (22.5%) out of 346 diabetics and 177 (18.1%) out of 975 non diabetics had an indwelling bladder catheter respectively. Distribution (%) of diabetic and non diabetic patients with urinary infection according to gender and age. Department of medicine, Pisa (1996–2003). E. coli was the most frequent uropathogen isolated, and was responsible for UTI in 32.5% of diabetic and 31.4% of non diabetic males (p = NS). Enterococcus spp was isolated in 9,4% vs 14,5% (p = NS), Pseudomonas spp was isolated in 8.5% vs 17.2% (p = 0.02) of diabetic and non diabetic patients respectively (Tab. 2). E. coli was more frequent in women (diabetics 54.1% and non diabetics 58.2%) than in men (diabetics 32.5% and non diabetics 31.4%). The isolation rate of Enterococcus spp (8.3% vs 6.5%. p = NS) and Pseudomonas spp (3.9% vs 4.7%, p = NS) was also similar in diabetic and non diabetic women (Tab. 3). The separate evaluation of women with symptomatic bacteriuria demonstrated, in both diabetic and non diabetic females with UTI, a similar frequency of the different strains (E. coli : 54% vs 58.2%, p = NS, Enterococcus spp 8.3% vs 6.5%, p = NS, Pseudomonas spp 3.9% vs 4.7%, p = NS). The rates of uropathogens in diabetic and non diabetics patients (males plus females) with indwelling bladder catheter were respectively: E. coli 30.8% vs 24.9%, p = NS ; Enterococcus spp 21.8% vs 16.45 %, p = NS; Pseudomonas spp 12.8% vs 18.1%, p = NS (Tab. 4). The rates of antibiotic resistance of E. coli in diabetic vs non diabetic patients were : ampicillin 29% vs 30.6%, p = NS; cotrimoxazole 19.2% vs 17.4%, p = NS; ciprofloxacin 11.6% vs 6.6%, p = NS ; nitrofurantoin 8.4% vs 6.9%, p = NS (Tab. 5). The Pseudomonas strains isolated in diabetic and non diabetic patients had similar patterns of resistance against antipseudomonas drugs: ciprofloxacin 50% vs 55.4%, p = NS; ceftazidime 41.1% vs 14.1%, p = NS: imipenem 16.6% vs 11.1%, p = NS; amikacin 16.6% vs 14.6%, p = NS. Antimicrobial resistance of urinary E. coli in patients with and without diabetes. Department of Medicine, Pisa (1996–2003). In this study we have tried to determine whether there are differences in the bacteriologic patterns of UTI and in the antibiotic sensitivity patterns of the pathogens concerned with diabetic and non-diabetic patients. The study was carried-out on a large series of elderly adult diabetic and non diabetic patients admitted to the medical wards. More than 70% of the patients were older than 65 yrs of age. The age and the gender were absolutely comparable in both study populations as well as the proportion of patients with indwelling bladder catheter. The rate of E. coli isolation we found in both diabetic and non diabetic patients was much lower than that usually observed in community acquired UTI, thus suggesting that a significant part of our patients had nosocomial acquired UTI. Other studies have found that urinary Klebsiella is more frequent in patients with DM than in non diabetic patients [22–24]. Some authors have defined UTI in patients with DM as complicated when the UTI is symptomatic [23, 24]. The spectrum of uropathogens we found in our patients and patterns of antimicrobial resistance in both DM and non DM patients are similar to those observed in other studies dealing with complicated UTI's. This finding can be explained by the fact that 20% of our patients had an indwelling bladder catheter. In addition many of our patients may have undergone previous antimicrobial treatment. When our patients with indwelling catheter were considered separately, the rate of the different uropathogens did not differ significantly in diabetic and non diabetic groups. The spectrum of uropathogens and antimicrobial pattern resistance we found in our series of patients with catheter associated UTI may be different from those observed in other hospitals. This may depend on the different policy of antibiotics used in the various hospitals. It is interesting to note that in a clinical setting different from ours, urinary isolates of symptomatic ambulatory postmenopausal women did not show a significant difference in the bacterial species when compared to a matched group of women without DM . We observed a higher isolation rate of Pseudomonas spp in non diabetic than that in diabetic males; therefore we must underline that many of our male non diabetic patients had a history of a previous instrumentation of the urinary tract. Regarding the antimicrobial resistance profile of the uropathogens, we observed that the isolated E. coli strains were resistant at similar rates to ampicillin, cotrimoxazole, ciprofloxacin and nitrofurantoin in both diabetic and non diabetic patients. The high rate of E. coli resistance to ampicillin and cotrimoxazole we found in our series precludes, at least in our area, the choice of these or similar drugs in the empirical initial treatment of adult hospitalized patients with UTI. In a study performed in an emergency department, an association was found between the presence of cotrimoxazole resistance and diabetes, recent hospitalization and recent use of the same drug  but in an out-patients setting no correlation was found between E. coli resistance to cotrimoxazole [27, 28] or to quinolones and diabetes mellitus. The proportion of Pseudomonas resistance to ciprofloxacin was very high as previously reported in our hospital but at a similar rate in patients with and without DM. We found a low proportion of E. coli isolates (especially in men) in hospitalized elderly adult patients with asymptomatic UTI in both diabetics and non diabetics. In addition, the resistance of the uropathogens to the antibiotics was similar in patients with and without DM. These results confirm our previous observations obtained on a smaller size sample of patients with and without DM . In our series of patients with asymptomatic UTI (mostly hospital acquired), diabetes mellitus could not be considered per se a risk factor for the emergence of a non E. coli organism and for antibiotic resistance. Silvia Costarelli, Giovanna Morelli and Tiziana Tartaglia contributed equally to this work. MB conceived of the study, coordinated the activity of the microbiology laboratory and the collection of clinical data and wrote the final draft. SC cooperated in the collection of the clinical data, in the validation of the microbiologic results and performed the statistical evaluation. GM cooperated in the collection of the clinical data and in the validation of the microbiologic results. TT cooperated in the collection of the clinical data and in the validation of the microbiologic results.